Texas LPCs can now earn all 24 hours required for license renewal via online continuing education (CE) courses! Click here to view online courses for Texas LPCs. 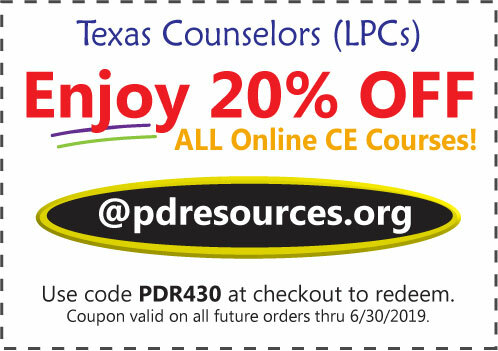 Information above obtained from the Texas State Board of Examiners of Professional Counselors website on April 2, 2019. This entry was posted in Mental Health and tagged @pdresources.org, CE, License Renewal, Texas Counselors, Texas LPC, Texas LPC Renewal Info, Texas LPCs, Texas LPCs License Renewal Info, Texas State Board of Examiners of Professional Counselors by Gina Gunderson. Bookmark the permalink.